World's fastest man , the Jamaican Usain Bolt has won an other Gold Medal in the 200m category in the London Olympics with an outstanding time of 19.32 s .
Behind him were his fellow Jamaicans who finished second and third to attain the Silver and the Bronze for Jamaica. Yohan Blake who was a serious contendor finished with 19.44 s,and the bronze medalist Warren Weir with 19.84. The American Wallace Spearmon, who also was in the serious contention for a Bronze finished at 19.90s just fractions behind Warren Weir. 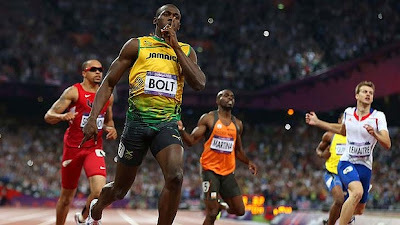 Bolt is the first man to win the 100m and 200m gold medals at consecutive Olympic games. Approaching London, he said only this feat would truly allow him to become a legend. He need not muse over his status any longer. 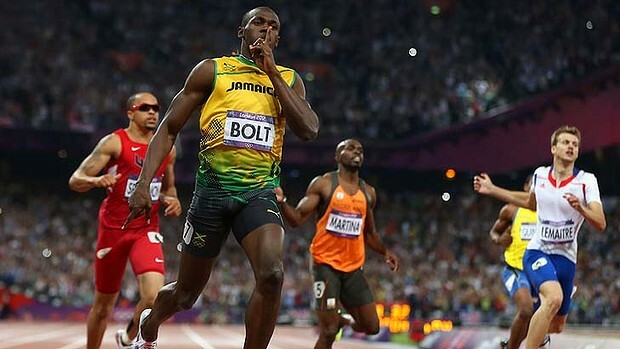 The only event in which Usain Bolt would be expecting a Gold will be Relay race, which with his strong Jamaican sprinter would be easily be winning the Gold medal. Following is the video of his epic 200m victory race.